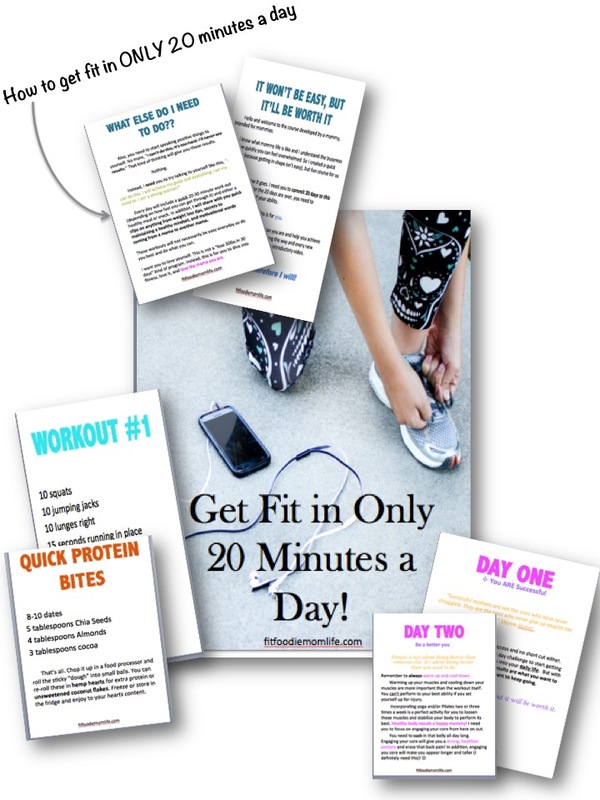 Get Fit in 20 Days NOW! Hi! I’m Vanessa. A fit mama who deals with crazy busyness, feeling overwhelmed, mom guilt, and trying to get through life. I’m just like you! I’m a mommy blogger with two littles who keep me active and keep life interesting and fun! I recently just created my very first freebie for you. It’s all about fitness and health. I want to show you and encourage you that health and fitness can be a part of your everyday life and it doesn’t have to involve 3 or 4 hours. Because none of us have that time. Sign up for the latest fit tips! Do you want to get fit but don't know how? Are you suddenly more curious and aware of your food but it still seems so overwhelming? I'm here to help you out. Join my email list to receive fit tips, healthy recipes, raising healthy children, how to spot the "bad" ingredients and much more! Yay! Thanks so much for joining me and I'm so excited to help you along your fitness journey! I’m your new mommy friend! I’m also your “fitness coach”, best friend, listener ear, and your go to mama when no one else is around. I want to help you win the body you’ve always wanted and I want to help you kick those cravings to the curb. I’ve done the research and know what works. I’m here to save you time. Please look around and download the 2 freebies I have to offer. 1. Involve your Kids– it’s almost impossible to get anything done with the kids around. So put on some good music, get moving, and everyone will be ready for naps by the end of it! Even 10 minutes is worth it. 3. Youtube everything— Not sure how to do a move? Youtube has an answer for anything. You can even follow along if you’re still confused. Don’t let a workout intimidate you. 5. Be sure to get enough sleep– I know this is hard with little kids. But make sure you catch up during the day somehow. Your muscles need recovery time and sleep is the best remedy for that! 8. Patience is key to fitness– the weight didn’t come on overnight so it won’t come off overnight. Or if you’re not dealing with weight issues, maybe it’s balance and strength. Set realistic goals. 10. Set goals– Write it down what you want exactly. If you want to lose 1-2lbs a week, write it down. If you want to see yourself exercising 3-5 times a week, write it down. Set those goals and stick to it! 2. Take the kids to the park– make good use of the monkey bars, stairs, benches, and big field. Kids can play and mommy can get some fitness time in! 4. Drink one cup of water every hour– Start your morning off with water and continue throughout the day. Feeling tired, bloated, and lightheaded? You’re probably not getting enough water. It’s important to flush out toxins. 7. 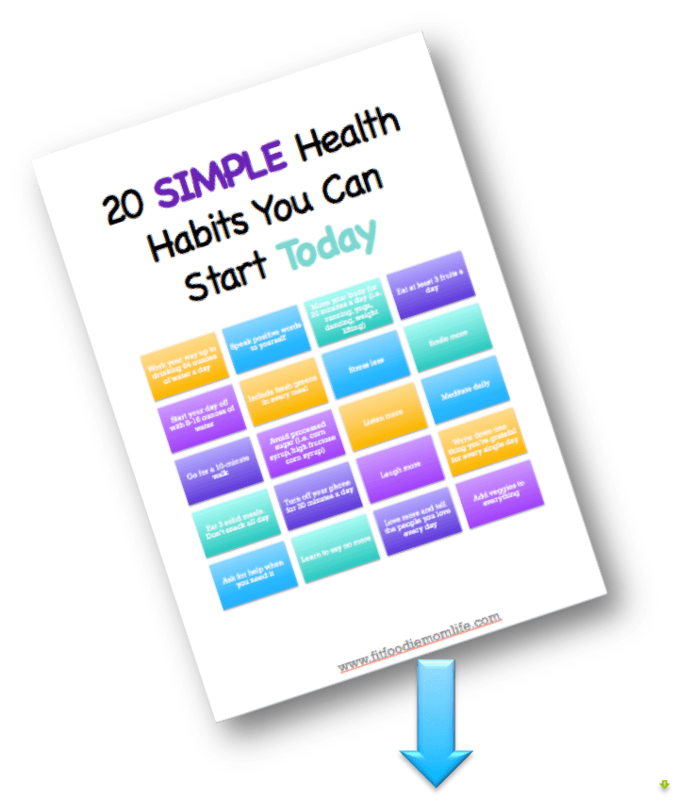 80/20– 80% of the time you’re a fitness guru and a health nut. But the remaining 20% you indulge in some serious chocolate cake, cookies, ice cream, or whatever your inner “food junkie” soul loves. It’s all about balance. 9. You have to be committed— If you’re motivated and tell yourself you can, you most definitely will. But first you have to commit that you want it. Once you want it, you’ll have the drive to get it. Commit to 3-5 days of exercise a week.